avFor several months, the BAML Fund Manager Survey shows that global institutions have been piling into emerging market equities. The purchase of EM equities has been a smart move, as they have been leading the market upwards. However, their time in a leadership role may be coming to an end owing to a series of disappointments. 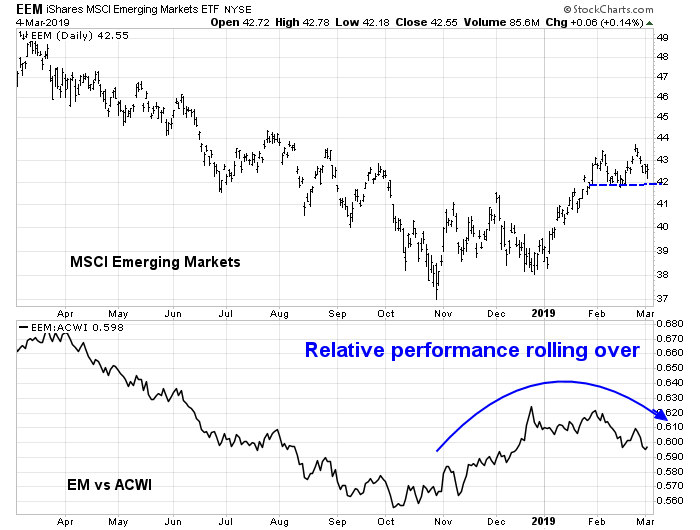 EM started to top out against the MSCI All-Country World Index (ACWI) in early February, and relative performance has been rolling over ever since. 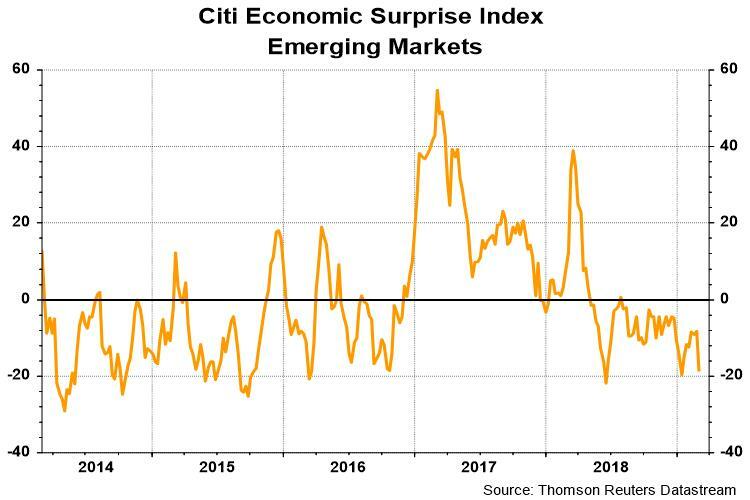 A glance at the Economic Surprise Index (ESI) tells the story. 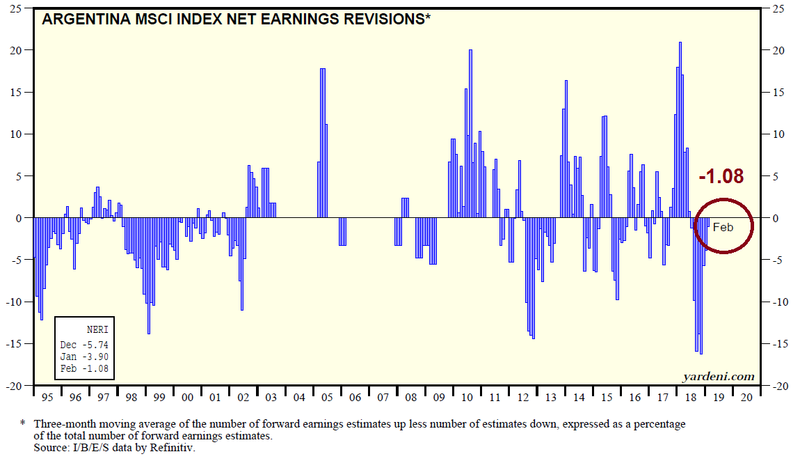 EM ESI has been declining, indicating that economic releases are increasingly disappointing compared to market expectations. 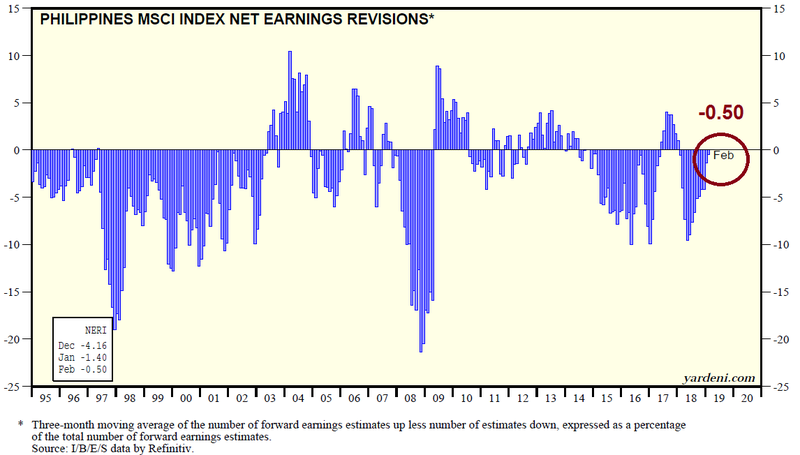 Yardeni Research, Inc. (YRI) just published their monthly summary of consensus estimate revisions around the world. YRI calculates a 3-month average diffusion index of upward revisions less downward revisions, normalized as a percentage of the entire sample. 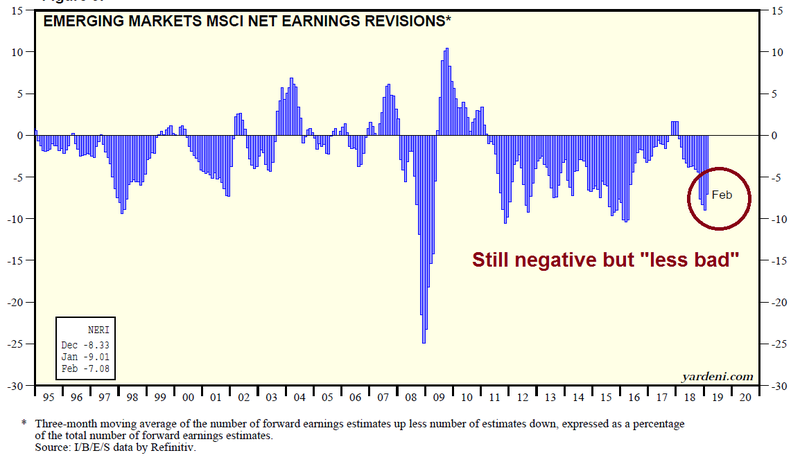 EM estimate revisions are still highly negative, but they are “less bad” as the rate of deterioration has been improving. Is that enough to be buying EM equities? I took a look at what countries could be causing the improvement. 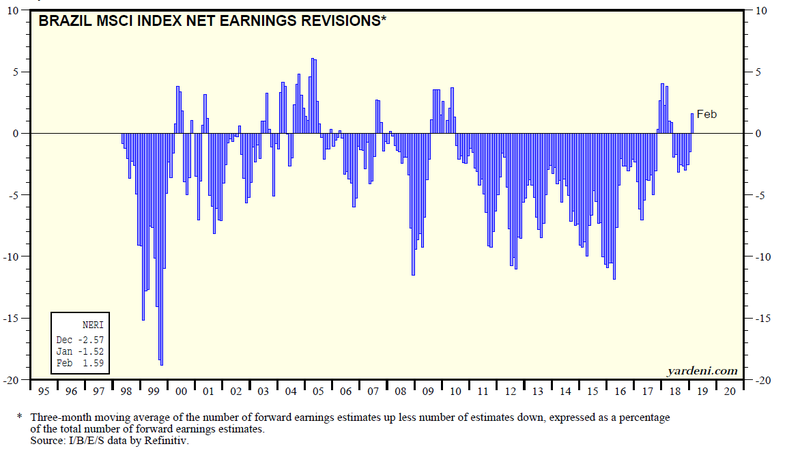 Only one, count them – one, actually showed a positive estimate revision in February. That country was Brazil. Two other countries were in the honorable mentions category by showing strong improvements. Overall estimate revisions remained negative, but the indicator was nearly positive (remember this is a 3-month moving average). The runner-up was The Philippines. The next one was Argentina. There have been many investment eyes on China owing to its economic slowdown and the outsized global effect of its trade discussions with the US. The Shanghai Composite rose Monday and broke through the 3000 level on the combination of “a trade deal is imminent” story, and the news of MSCI’s dramatic increase of China equity weights in its global indices. Here is where hope may be running ahead of reality. Even as Chinese equity ETFs have decisively broken out through resistance, soybean prices have failed to rally above its resistance level. The strength in Chinese shares was largely attributable to foreign buying. The latest statistics on the HK-Shanghai flows shows an enormous spike in northbound (HK to Shanghai) flows. At the same time, the SCMP reported that insiders are selling even as foreigners buy in. Take a look at who owns China’s US$6.4 trillion stock market. At 2.2 per cent, foreigners’ sway is tiny. And while local retail investors are blamed for the 2015 stock-market frenzy, they hold only 20 per cent. The majority of shares are still controlled by insiders: founders, management and parent holding companies. As early as May 2017, China’s securities watchdog tightened regulation on stock sales by majority shareholders. The move was intended to protect retail investors and strengthen corporate governance. But that hasn’t stopped insiders from selling, even at the risk of facing the regulator’s ire. In the three weeks ended February 23, such investors – concentrated among firms listed on the private-sector ChiNext board – were net sellers of more than 4 billion yuan of shares, according to data compiled by Sinolink Securities. On Monday and Tuesday, when daily trading volume exceeded 1 trillion yuan, close to 80 companies filed insider-selling disclosures with the Shanghai and Shenzhen exchanges. To be sure, the foreign buying frenzy is probably not over yet. 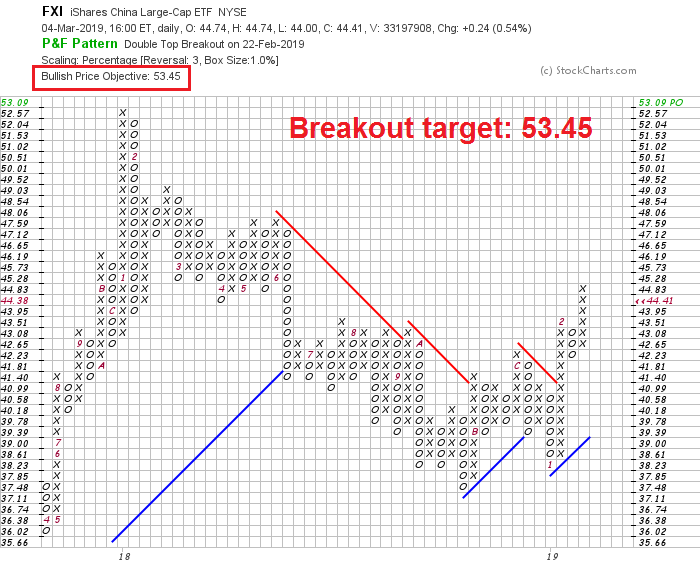 The measured point and figure target on FXI is 53.45, which represents a potential upside of 20% from current levels. 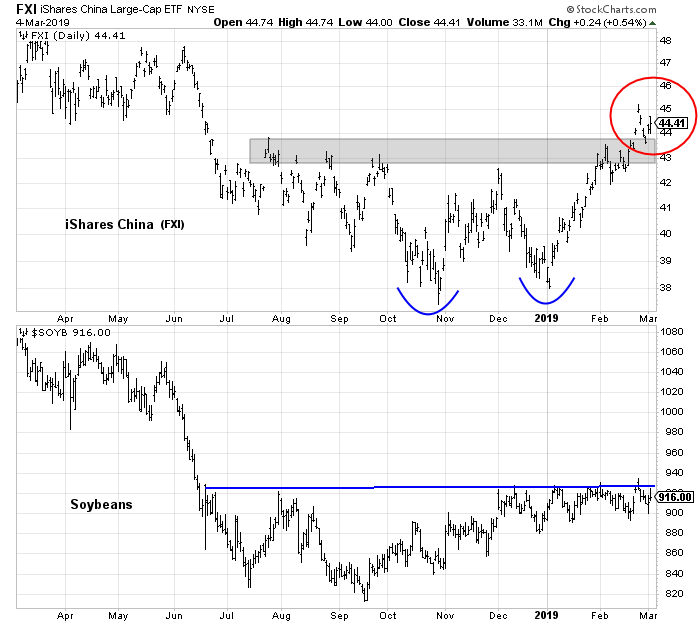 I had highlighted a buying opportunity in Chinese stocks in January (see A buying opportunity in Chinese stocks?) and they are up between 6-20% in USD terms, depending on the chosen ETF. In light of the combination of technical relative deterioration in EM stocks, macro disappointment, narrow estimate revision leadership, and insider selling in China, this is not the time to committing new funds to EM or Chinese stocks. 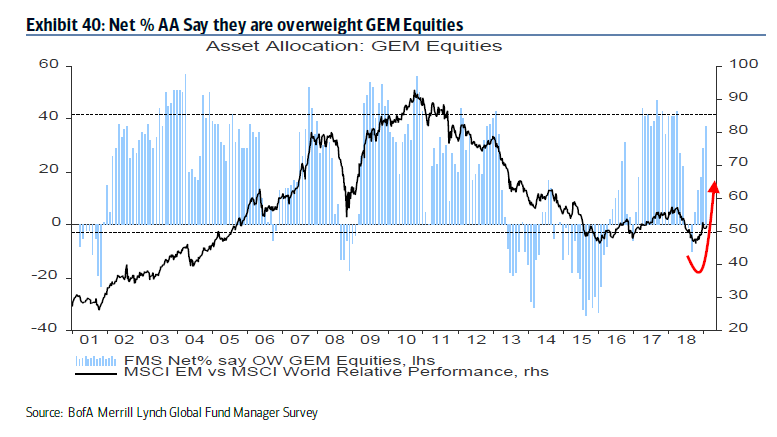 From a global perspective, since EM equities led the market up in this latest rally, the latest bout of relative weakness may be a warning that a prolonged risk-off episode is ahead in the weeks ahead.